indésensrecords, a label founded by Benoit d'Hau "to find a right place in the CD world, even if the industry is completely saturated by too many productions of all all kinds, to find its unique identity for each album, to let emerge the specificities of the French tradition of wind instruments, and to offer a nice place to today's composers"
Two releases from a label unknown to us, one whose credo is close to our priorities. 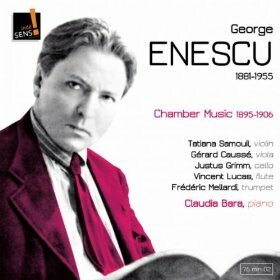 The early Enescu programme makes for a pleasant, easy listening sequence - but nothing "essential" of this great Rumanian composer's oeuvre here. The trumpet Legend is the most substantial and characteristic; three pieces for violin and piano duet the most unusual. 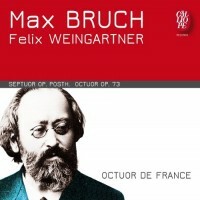 Bruch's Septet is nothing special, though remarkable for its competence, having been composed when Max Bruch was a child of 11. It should be considered for performance by the Music Colleges' Junior departments, or by the younger entrants to the Yehudi Menuhin School ? 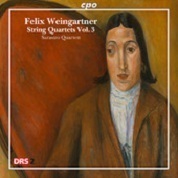 Felix Weingartner's Octet is impressive and thoroughly enjoyable. Well known to older collectors as a famous conductor, he succeeded Mahler at the Vienna Opera in 1908 and was the first to record the Beethoven & Brahms symphonies. A prolific writer and lifelong composer in all genres, this Octet is impressive and durable - "his language remains attached to traditions but it is far from being closed" [Georges Boyer]. A fine chamber work which college students would find rewarding to study, and one which would please London's chamber music audiences at Kings Place and Conway Hall. It has a jaunty finale which is irresistible. Excellent performances, recording and production. The two composers are listed with wrong typographical emphasis on the cover ! These are less interesting than the Octet, above. A curiosity is that the lengthy notes are devoted to a veritable character assassination of Felix Weingartner as a person, a thesis indulged with zest through eight small-print columns by annotator Echard v d Hooten.